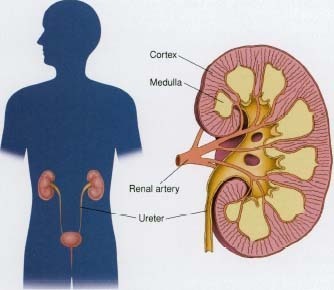 Kidney Disease - body, What Are the Kidneys? Acute disorders occur suddenly, for example from a block-age of the kidney drainage system. People can be born with a kidney disorder, in which case it is called a congenital disease. For example, the two kidneys may be connected at their base to form a single horseshoe-shaped kidney. Some people have one kidney missing from birth, or two on one side, or two ureters (the tubes that carry urine from the kidney to the bladder) for one kidney. A person's body usually can adjust to these problems because people can function with one kidney. Chronic, or long-lasting, kidney diseases are very serious conditions because they cause the kidneys to deteriorate over time. Glomerulonephritis (glomer-u-lo-ne-FRY-tis) is a condition in which the filtering units of the kidneys called the glomeruli (glom-ER-you-li) become inflamed. It often accompanies other diseases such as diabetes * and high blood pressure, or it can develop as the result of a bacterial infection or immunologic disease. 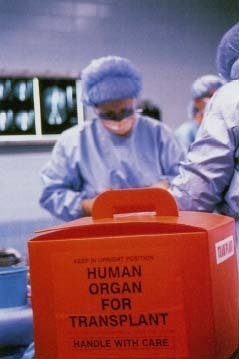 Organ for transplant. If kidney disease leads to kidney failure, dialysis or kidney transplant may be necessary. © 1996 Michelle Del SuerciolCustom Medical Stock Photo. The immune system makes proteins called anti-bodies to fight infection. In glomerulonephritis these antibodies become trapped in the glomeruli causing them to become inflamed. Glomerulonephritis may be treatable, or it may progress and cause severe kidney damage. Cancer, or tumors in the kidneys, also over time can stop the kidneys from functioning properly. Eventually, many of these diseases lead to end-stage renal disease (ESRD), a condition in which the kidneys shut down. Disorders that affect the proper functioning of the kidneys may be diagnosed by a number of methods: blood tests, urinalysis, kidney imaging (such as x-rays and MRI scans * ), and renal (kidney) biopsy (taking a sample of tissues). These tests are used to determine the type and extent of kidney disease. * diabetes (di-a-BEE-teez) is a disease in which the body cannot produce sufficient amounts of the hormone insulin to properly regulate the amount of sugar (glucose) in the blood. The kidneys are located on both sides of the spinal column just above the waist. U.S. National Kidney and Urologic Diseases Information Clearinghouse, 3 Information Way, Bethesda, MD 20892-3580.